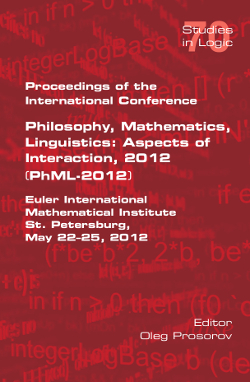 This Volume 70 of the Studies in Logic series contains the Proceedings of the Internatioanl interdisciplinary conference Philosophy, Mathematics, Linguistics: Apsects of Interaction 2012 held on May 22-25, 2012 at the Euler International Mathematical Institute, St Petersburg. It provides an opportunity for researchers to be acquainted with selected and expanded papers which were presented during the conference. The collection is interdisciplinary in character, it includes research papers and advanced expository papers presented by philosophers, mathematicians, logicians, computer scientists and linguists. The book is intended, therefore, for a wide range of scholars who are interested in the interaction of philosophy, mathematics and linguistics.